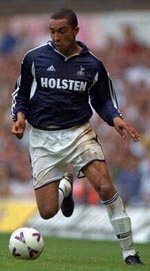 When he signed for Tottenham in June 1995, not only did forward Chris Armstrong face the daunting task of being the replacement for Jurgen Klinsmann (who had left at the end of 94-5 after his first spell at White Hart Lane), but he had the additional burden of being our then record signing, having cost us £4.5million. On his departure from the club at the end of last season his value, following his release by manager Glenn Hoddle, who had been in charge at the Lane for over a year, a period during which he had never been able to assess Armstrong properly due to the striker’s persistent problems with injury, had reduced to nothing. I would assume that Spurs were just glad to remove him from the wage bill. Armstrong had been bought by then Spurs manager Gerry Francis mainly as a result of an impressive spell with Crystal Palace, most notably in the Eagles’ 1993-4 Division One championship winning season when he scored twenty three league goals. The striker had been prone to the odd goal drought and promptly embarked on one in an ignominious start to his career at the Lane. Spurs fans are not renowned for their patience and it didn’t take long for doubts about the wisdom of the signing to be voiced. After six goal-less Premiership games Armstrong broke his duck with two strikes in the League Cup win over basement side Chester City, celebrating on front of the visiting fans who had branded him a “waste of money”. Once he’d scored his first league goal (at Everton) he settled down to form a good partnership with Teddy Sheringham. Between them, the two scored thirty one out of the fifty league goals we managed that season, with Sheringham finishing one ahead. We ended up in eighth position and there was the promise of more to come. 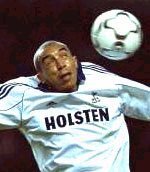 However, with the exception of the 1999-2000 season, when he was our top league goalscorer with fourteen goals in thirty one appearances, Armstrong went on to endure a fairly torrid time at Spurs. Plagued by regular injuries and the odd bout of loss of form from the beginning of his second year with us, Armo only managed seventeen goals in sixty five appearances in the three seasons between 1996-9. His relationship with the fans broke down when he became the target for their anger and frustrations for the team’s poor results and he refused to acknowledge or celebrate with them whenever he scored. By the latter days of his Spurs career Armstrong seemed to have lost all respect for our followers. He missed the whole of last season through injury, his final appearance for us coming in December 2000 against Southampton. Chris tried to make a comeback at the end of last season in the reserves, but he looked like it had come too soon for him with time running out to earn a new deal. He looked out of touch and rusty from his time out of the game, which he probably felt he had to play to try and impress the watching manager. The move to Tottenham had come at an important time for Armstrong, who had established himself as a regular goalscorer with excellent pace who was also good in the air. He was then twenty four years of age and would have been looking at the next few seasons to be the best ones of his career and maybe even force his way into the full England side (he had won one cap at England ‘B’ level). He did get a call-up from Kevin Keegan after the Worthington Cup Final (where he occupied the bench throughout), but never made the step up to the full side. Armo’s stay at Tottenham was mainly a disappointing and frustrating one as he only managed 141 appearances in seven full seasons. His final goal tally for us was forty-eight. Now aged thirty one, it will be interesting to chart the remaining years of Armstrong’s career and whether he finally overcomes the persistent injury problems and manages to reproduce something like his best form. For Tottenham, he had become too much of a risk to take and Glenn Hoddle’s decision not to offer him a new contract at the end of last season had a certain air of inevitability about it, despite Armo still training with the club until he fixes up a new deal elsewhere.